Majestic Cream Royale with Red Velvet Cope, handcrafted in the U.S.A. on wrinkle resistant, light weight, breathable fabric. Gold Cross applique added to the cope hood and Red Velvet front panels gives the cope added dimension and flair. 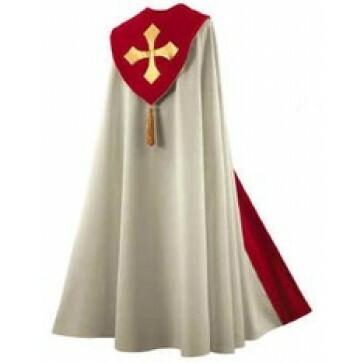 This beautiful cope comes with standard attached hood with 6" tassel and metallic clasp closure. This cope measures 60" length which is standard on all of our copes, custom lengths are available at your request. Humeral veils can be made to match any of our designs.